Snow is expected in the north, with high winds and ice also set to cause disruption. Drivers have been warned to take extra care this weekend, as snow and ice is set to dazzle parts of the country. Weather warnings for snow and ice have been issued and a strong northerly wind is expected to turn these snowy conditions into blizzards. The wintry weather is forecasted in northern parts of the country in particular, with snowfall reaching up to 15cm in some areas. In the Highlands, the heavy rain from Friday night will turn to snow on Saturday, increasing the risk of icy conditions on the road. On higher ground, snow of up to 15cm could accumulate. On lower ground, areas could see between 5cm and 10cm of snow. In Tayside, Fife and Aberdeenshire drivers have been warned to prepare for blizzard conditions and drive carefully as snow and ice will cover the roads. 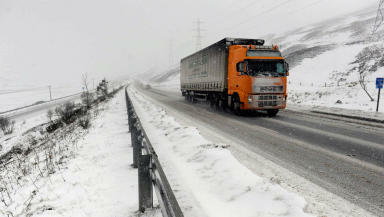 "After a spell of colder weather this week, on Friday the weather turned much milder, hitting 10C in parts of the west. "It didn't last though - colder air is returning this weekend. "The rain that affected the west throughout Friday and moved into northern parts of the country overnight will turn to snow as the colder air starts to dig back in." 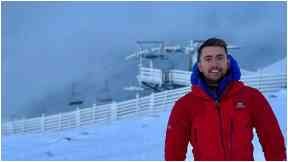 Sean: Pictured last week on the Nevis Range.